UN-Habitat Sri Lanka | Sri Lanka Celebrates World Habitat Day 2018 “Municipal Solid Waste Management” in Kurunegala. UN-Habitat Sri Lanka > News > Sri Lanka Celebrates World Habitat Day 2018 “Municipal Solid Waste Management” in Kurunegala. 1st October 2018, Kurunegala, Sri Lanka. 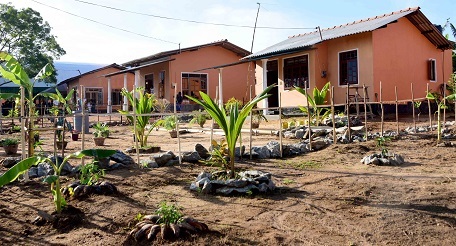 The main National event to celebrate Word Habitat Day 2018 was held in Sri Lanka at the Kotawehera DS Division in Kurunegala district. The Chief Guest at the celebrations was Hon. Sajith Premadasa, Minister of Housing and Construction. This important national event focused on the 2018 World Habitat Day theme “Municipal Solid Waste Management”. Following the main event, a model village named “Jagath Nivahangama” (World Habitat Village) was ceremonially opened by the Hon. Minister. Organised by the Ministry of Housing and Construction, the event was attended by over 2,500 community members and beneficiaries. Addressing the gathering, Hon. 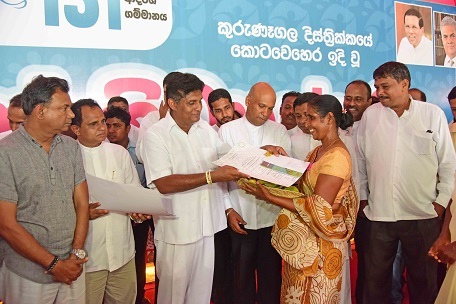 Sajith Premadasa stated that the Ministry of Housing and Construction has been at the forefront of World Habitat Day since 1986. He expressed his appreciation to all agencies and institutions for their dedication in implementing Sri Lanka’s Shelter Development programme. Hon. Indika Bandaranayake, Deputy Minister of Housing and Construction, Hon. 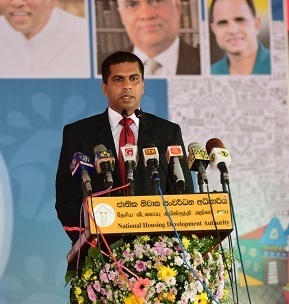 Nalin Bandara Jayamaha, Deputy Minister of Public Administration & Management and Law and Order, Hon. Ashok Abeysinghe, Deputy Minister of Transport & Civil Aviation, Dr. Chanaka Talpahewa, Country Programme Manager of the United Nations Human Settlements Programme (UN-Habitat) also participated at the event. Mr. Gamini Ilangarathne, District Secretary of Kurunegala, Mr.Bernard Wasantha, Secretary of the Ministry of Housing and Construction, representatives from housing and urban sector agencies and senior officers of the Ministry of Housing and Construction in Sri Lanka were also present. The event also featured song and dance presentations by local school children, handing over of prizes to school children for art and essay competitions and presentation of house ownership documents to residents of the model village “Jagath Nivahangama”. In addition to the main event, the Ministry of Housing and Construction organised a series of events to celebrate “Urban October” week including special programmes targeting children, youth, women and elders.